JR: I am here today with Stephen Knight, author of The Gathering Dead. Tell us a little about yourself and your book. SK: I’m a native Texan from Corpus Christi who lives in the New York City area—and before anyone makes any George Bush jokes, I’d like to remind them he was born in Connecticut. I was traded out when he moved to the Lone Star state as a kind of balance of terror deal. The book in question is called The Gathering Dead, which basically takes the reader through the beginning of the zombie apocalypse as it strikesNew York City. In the book, we follow the adventures of a highly-trained Army Special Forces alpha detachment trying to survive as the excrement hits the rotary oscillator. JR: I am not typically a fan of zombie books, or movies for that matter, but your story is different then many I have read. Are you a fan of zombie books and movies, and if so, what are some of your favorites? SK: I haven’t read much zombie fiction. I’ve read World War Z, which I thought was excellent. I also read a novel by Brian Keene called The Rising, I believe, which was all right. And that’s literally it for books. I do like the movies, though—certainly all of Romero’s works, campy as they are. 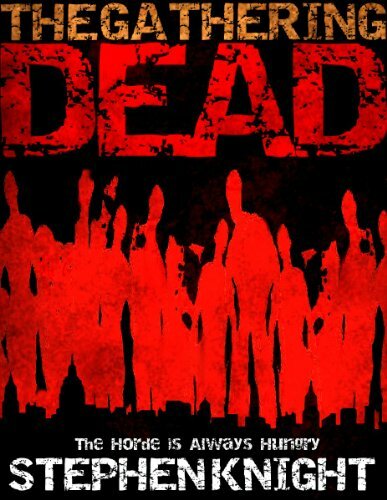 And the 2004 remake of Dawn of the Dead, which certainly amped things up compared to Romero’s original. I liked 28 Days Later…I even watched Zombie Nightmare, because one of my good friends did the makeup effects. JR: I like movies and books that portray zombies to be fast as I feel I could outrun the typical slow moving zombie. Or at least unload enough artillery to keep them at bay. Do you feel zombies are scarier fast or slow? SK: I think that individually, faster zombies are a greater threat. But if you’re alone, on foot, with limited ammunition, and you’re out of time and ideas…a shambling horde that draws inexorably closer can be much more horrifying. In The Gathering Dead, there are both: those stenches that are physically in good shape can still move fast, but those that have been degraded tend to stumble and bumble mindlessly…until they see their next meal, then its slow and steady wins the race. JR: What inspired you to write The Gathering Dead? SK: I was listening to the score for the film The Haunting by Jerry Goldsmith, and one of the tracks evoked a mental image of a team of soldiers and civilians standing on a midtown skyscraper watching as the city falls to the dead. In the streets below, there are thousands of carnivorous corpses, and they’re looking out over this literal army of the dead and wondering, “Jesus, how the hell are we going to get out of this?” And that’s where I started from. JR: It’s always fun to think how you would handle certain situations, real or not real. I would sail to a deserted island with a ton of ammunition and hope for the best. How would you survive a zombie apocalypse? SK: Only two choices I can think of, barring leaving the planet: getting to an area of high elevation and making a stand, or building a bunker somewhere and sitting it out. Of course, if the walking dead take over the planet, either circumstance is likely to provide diminishing returns! If there’s no one to save you, you have to hide and scrounge, but eventually, an enemy as implacable and determined as the dead will probably find you. JR: I think horror has fallen off since the height of the Stephen King era, but I believe it is making a comeback. How do you feel about the state of the horror genre now and where will it move from here? SK: I don’t think horror has the same kind of staying power as other genres, such as science fiction or romance. But it has gone through a bit of resurgence as of late. I wouldn’t call it a renaissance or anything like that, but it has spiked a bit, which is certainly good news for a lot of us. I’m not sure what the future holds for horror, as it’s still viewed as something of a “lowbrow” genre, but it’s undeniable that it has some degree of consumer appeal. And even King set the high water mark for the genre; it can be argued that he no longer writes “horror” in the strictest sense. JR: I have experience with many authors who don’t know how to promote themselves or don’t realize that even with a publisher backing them, they must promote themselves. What advice would you give an author who has no idea how to promote their product? SK: If you don’t know your audience, you’re dead. Sure, people can and will always find the product they like, but it helps if you know who to go after to buy your work. The usual channels have worked for me: Facebook, Twitter, my blog. Then there are the personal connections through friends and family and, if you have the stomach for it, through your day job if you have one. Make sure you join Goodreads and Author’s Den. And enable sampling for your product—I even allow lending for mine after it’s been purchased. Correspond with your readers or potential readers in the Kindle product forums, but don’t oversell yourself. But the best thing to do is to really, really, really work hard on your product. Even today, I still get dinged from typos in The Gathering Dead, so you’d better police your work very, very closely before releasing it into the wild. I’m fortunate in that I have only a handful of bum reviews, but people read those as well as part of the buying decision cycle. So ensure you’re not making yourself a soft target by releasing something that isn’t ready. JR: What is the best way to kill a zombie? SK: 12-gauge blast to the head seems to have the best results, though I would not discount the efficiency of nuclear weapons. Kind of tough on your fellow survivors, though. JR: I ask this question to every author I interview. How do you overcome writer’s block? Staring at the screen with no thoughts coming to your head or no motivation to write. SK: I actually blogged about this a little while ago (shameless plug:https://knightslanding.wordpress.com/2011/07/01/how-it-happens-it-starts-with-music/) where I bloviated about the importance of music to get my creative juices flowing. But even without tunes, I can still write. I have to; it’s what I want to do. A blank page can be either a starting point or an ending point, and the latter is of no value to me. I know lots of would-be writers who can’t get past the enormity of filling up a blank screen with a bunch of words, even if they don’t make any sense. It’s a job, not a dalliance, so sit down and do it. If you don’t, you lose right off the bat. Go dig a ditch or something more productive. It really is just that simple. And it helps if you have an idea of what kind of story you want to tell. Even if you’ve only figured out the midpoint of your story, start writing so you can get there, and along the way you’ll figure out how to tie it off. JR: What other projects are you working on and what genres do they fall into? JR: I give all my guests the opportunity to ask me a question. You only get one so choose wisely. SK: How’s business from the publishing end? JR: Business is good. I have received more quality submissions in the last year then in my first 5 years combined. But, like many in the industry, I really hate the fact I ignored e-books as long as I did. I thought it would be a fad and die off, but now it looks like hardbacks will become a novelty. Sales are still solid, but marketing and promoting products has changed significantly. Overall, we are ok.
Publishers are…having a tough time. Authors are typically…unaware that this is a business. Casey Anthony should…pose nekkid, it’s probably the only job she’ll ever get. My last meal would consist of…kobebeef. People always tell me I look like…Bruce Willis. Of course, they’re all fromAsia. One thing people would be surprised to know about me is…I’m directly related to the man who shot Billy the Kid. So don’t mess with me! This entry was posted in Author Interviews and tagged Author Interview, Casey Anthony, Hobbes End Publishing, Horror Book, Jairus Reddy, Stephen King, Stephen Knight, The Gathering Dead, Zombie, Zombie Apocalypse. Bookmark the permalink. This was an amazing interview! Good work. Thank you. I had a lot of fun with it as did Mr. Knight. I sure did! And Jairus, I was thinking a couple of days ago…maybe with the whole e-pub explosion, horror really ISN’T relegated to has-been status. It seems like horror titles are actually doing much, much better electronically than they have been in print. And there are all sorts of variations that are available now, such as paranormal romance and the like. So maybe I was a bit off when I answered that question. Consider it amended! I purchased Mr. Knight’s work after reading this interview. Thanks for sharing and he’s a great writer. Thank you Ben. I am glad you enjoyed the interview.